Your choice of speakers should be based on audience coverage requirements as well as the venue size. There are some things to consider such as the venue's room shape. For example, considering the sound's interaction with the room's boundaries: walls, ceiling and floor. When deciding on a speaker system, you’ll want to review the tech specification guide, which should be readily available from most reputable pro audio manufacturers. The most important specs to know are the frequency response, SPL output, and dispersion. If you are using passive speakers, then you’ll need to know the wattage and impedance (ohms resistance). 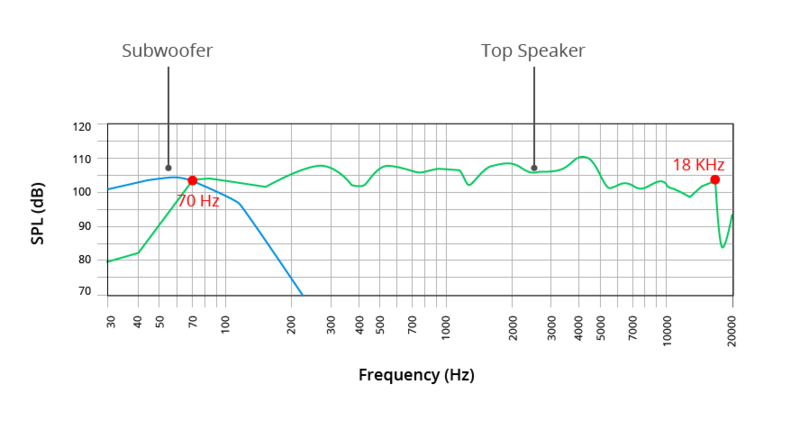 Speakers with a frequency response of 60 Hz to 18 kHz will work well for many genres of music: country, folk, or folk-rock, where the drums or bass will not need additional "punch". For hard (or contemporary) rock, metal, pop, hip hop, EDM, etc., you will need a subwoofer. A subwoofer will extend the sound's frequency response down to 45 Hz or lower and will allow the full-range speakers additional headroom and increased output. The level of the speaker's sound pressure of a speaker will determine how loud a speaker is at a given distance. Most technical specification guides will show Peak and Continuous outputs. The peak is how loud the speaker can go, while continuous output is the average loudness. Sound pressure levels (SPL) will reduce the force by 6 dB with the doubling of the given space. If a speaker was capable of 135 dB at 1m, then 2m would have an SPL of 129 dB. 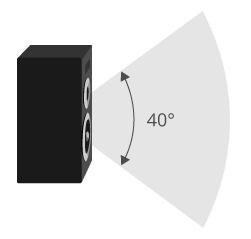 By doubling the distance to 4m, the speaker would output 123 dB and so forth. Another consideration is that doubling up on the speakers will result in a +3 dB increase. If a speaker has a peak output of 135, by adding another speaker the output would grow to 138 dB. Dispersion is incredibly useful for determining where your speakers should be placed, as you can direct your speakers and the sound away from the venue's boundaries such as walls, ceilings and floors. This is determining the way the sound is projected horizontally and vertically from the PA speaker system. 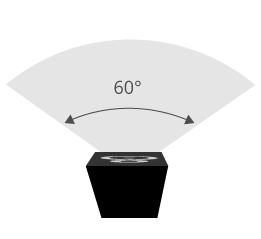 For instance, a speaker with a 60-degree horizontal dispersion might work well for a narrow room, while adding an additional speaker could increase the dispersion to 120. A sound tech engineer's goal is to offer coverage to the entire audience, while directing the sound off the walls. Many speakers are designed to couple by utilizing a trapezoidal enclosure, versus a square or rectangular enclosure. The vertical dispersion will determine how high the full-range tops will need to be to provide the right sound coverage for the venue's audience. There are many ways to configure a system, in terms of height and whether ground-stacking the speakers, as well as considering stands and other support systems, scaffolding, or trussing should be implemented as a way to get the speaker high enough to offer extended coverage. The higher the speaker, the farther the sound will travel. If it is too high, there will be a loss of impact in the front. Not high enough may result in the sound being uncomfortably loud for the front row. For our purposes, I suggest setting the tops at shoulder to head level, about 5 to 6 feet from the floor. If you are utilizing subwoofers, you might try ground-stacking the tops on top of the subs. This is the simplest way to get proper height, especially if you don’t have multiple subs to create a ground stack. In order for musicians to be heard, it's crucial to choose the right microphone. They are used to capture vocals, guitar amplifiers, and drums, the cornerstone of live music. There are plenty of microphone manufacturers to choose from, but the favorites are still the Shure SM58 for vocals and the Shure SM57 for instruments. They have proven their value over time by sounding good and being incredibly rugged. In addition, they offer clean, clear sound without any artifacts, and with a simple setup. There are some diehard analog fans who will not move to a digital mixing board because they believe that analog mixing components sound much better than digital. Most analog mixing consoles will offer a built-in four band parametric EQ, which helps balance the overall tonal sound and carves out space for each instrument in the mix. It is rare to find analog mixing boards with built-in dynamics available on every channel. Therefore, an all-analog set will require several racks of gear to assist the added signal processing, such as compression and gates for each channel. The most important thing is to use your ears when making decisions. Always listen to speakers before purchasing and, if possible, demo speakers and subs together, especially if you are using different brands. I can’t recommend enough the importance of having a dedicated speaker processor for any system, regardless of size or budget. For more information on live sound set up, check out www.SonidoLive.com for details and equipment deals!